March 7, 2019 March 6, 2019 Rev. Robert Moeller, Jr.
“Yet even now,” declares the Lord, “return to Me with all your heart, with fasting, with weeping, and with mourning; and rend your hearts and not your garments.” Return to the Lord your God, for He is gracious and merciful, slow to anger, and abounding in steadfast love; and He relents over disaster. Who knows whether He will not turn and relent, and leave a blessing behind Him, a grain offering and a drink offering for the Lord your God? Blow the trumpet in Zion; consecrate a fast; call a solemn assembly; gather the people (Joel 2:12-15). We find our identity is very much tied to our family—for better or worse. Healthy families do lots of different things together that bind them as family. Some families work together. Other families play together. But one of the things that binds together families the most is when they gather to share a meal. Hence, those family meals at Christmas, and at Easter, at Thanksgiving, and at other holidays, birthdays, and so on. When we gather together and we experience something as a group, it is far more profound than to do something or experience something by ourselves as individuals. That is why God gave family to begin with, with Adam and Eve and their children. Families are a great gift of God! We come to problems, though, when we begin to see our family as the end itself. Like other great gifts of God, we can turn our families into idols, putting them ahead even of our relationship with God. We can so easily forget that we’re really part of a bigger family, the family of God, the people of God gathered around the holy things of God—His Word and Sacrament. You and I are a part of the wonderful thing known as the Church, and we are family who gather around this central focus point where God gathers us and calls us. And it is this shared experience and shared journey that defines us as family. What is a family all about? Your earthly family at home is about nurture and encouragement and love and support; but let’s be honest: it can also be a place of pain and sorrow and brokenness because of sin. Arguments and disagreements arise between spouses and between parents and children. Unresolved conflicts fester. And there is still all that history that has shapes us for better or for worse. It is no different in this communion of saints of which you and I are a part. We come here also with a great amount of baggage, not much different than any family. What are we a part of? That is the interesting thing about family. Looking at your own family, there are perhaps some of your siblings who kind of skirt along the outside of the family perimeter either because of some past perceived slight or sin or some present offense that keeps them at arm’s length, or they don’t really want to involve themselves. Or maybe it’s just because of the rest of the family is highly dysfunctional! Who knows? This is where dysfunctional people gather, isn’t it? This is where dysfunctional families gather. This is where imperfect husbands come for repentance and forgiveness and imperfect wives come for repentance and forgiveness. This is where children who did not honor their parents come for repentance and forgiveness. And parents who laid such high and lofty goals and expectations come for repentance and forgiveness. This is where brothers and sisters who have not always put the best construction on things with other brothers or sisters come for repentance and forgiveness, as well. In the Old Testament text, Joel was exhorted by God to gather all the people: the elders, the children, even nursing infants, the bridegroom and his bride. No one is to be excluded from this holy assembly, this family get-together. That’s no different than it is at your home, is it? You want everybody to be there, from grandpa and grandma to the newborn, gathered around that table to rejoice, and to sometimes talk and discuss, to give blessing and to receive blessing. In coming here to this holy assembly, we come as people set apart from the world of which we are merely pilgrims and wanderers, and who are not, though the temptation is great, setting roots in this world. Our Lord Jesus makes that very clear in the Gospel: “Where your treasure is, there your heart will be also.” He exhorts us to lay up treasures for ourselves in heaven. But is that exhortation only for you and Jesus, or is that exhortation for you as a brother to encourage someone else, as a sister to someone else, as a father or mother in the faith to someone else? When it comes right down to it, there is only one thing we can bring with us beyond this life—that is our fellow believers, our loved ones in the family of God. And we need to repent, for we haven’t always put the best construction on the actions and words of others within this holy assembly. We have not given grace as much as we’ve expected it from others within our communion of saints here. We have not been willing to step up and encourage one another as fellow redeemed in this solemn assembly whom God has called together, whom He has marked as dust to remind us that we are all the same and that there is only one hope. The dynamics of family life are fascinating to watch, aren’t they? Moms and dads get stuck in a rut of viewing their children still as children and not as adults, forgetting they have made great strides and accomplishments. Even though they’ve grown up and moved out, they still see them as kids. And the kids can so easily forget that their parents have gone through life and are wise, imperfect though they may be, but at least wise in experience. They’re not always ready to listen to their elders. Sisters and brothers vie for attention and for those accolades from parents, and are still seeking it even though they have their own children. These kinds of dynamics occur within a parish family, too. 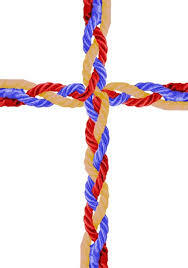 In any parish family, there are those who have longstanding status in that parish family and those who are newcomers. This can prove to be a challenge. There is not always a great nurturing of newcomers by the longstanding ones. There isn’t always an appreciation by new individuals within the parish family for the traditions that the longstanding ones have established, the achievements they have sweat for, and challenges they have sacrificed to overcome. Sometimes the congregation can be seen merely as a way station and not an investment of our heart. But in a normal and healthy family, you have to sacrifice and give of your emotion in order for it to be a healthy family. You have to do it in a church family as well. And just like you may have gotten burned in your own family, you will get burned in a church family. But that is the nucleus around which God has deemed us as His children to gather. We are not to neglect the communion of saints to which we have been called. And yet there are those who have, and our job is to call them back to the family. We are to invite them back, bring them back, encourage them back. And those who are still licking wounds of years gone by, we are to help them bind up their wounds, receive forgiveness, and grow forward. Satan’s desire is to splinter God’s family, not only ones in your own home and house, but in this house, too. And he wishes to splinter it by creating individuals and depressing the concept of belonging to something bigger than individual. Why do people drift away from the church? Because Satan has gotten them to thinking that they don’t need this communion of saints, or they’re too sinful, or that we’re too hypocritical. Satan is a prowling lion, and he wishes to split you off from the herd, because that makes you more vulnerable to his attacks. We repent. We reflect upon our own sin and our mortality: “From dust you came and from dust you shall return.” And we remember the promised Seed of the Woman, who would crush the serpent’s head, who would defeat sin, death, and Satan with His atoning sacrifice. That is what we do when we gather here on Ash Wednesday. That is our life every day, a life of repentance. And it’s not that one needs to repent more than the other. We all need it the same. That is why gather in this holy assembly. Here, we all come to hear the same Word of God—the Law that shows us our sins and our need for repentance. And the Gospel, that tells us how God so loved the world that He gave His only begotten Son, that whoever believes in Him should not perish, but have everlasting life. Jesus lived the perfect life that you and I could not live. Jesus died to pay the penalty for the sins of the world—your sins and my sins. Jesus rose again from the grave giving us the certain hope of our own resurrection to eternal life. This is why we gather together in this holy assembly. That is why we come to hear the same absolution from the mouth of God’s called and ordained servant. That’s why we join together in the liturgy and singing the great Lenten hymns. That’s why we all come here and kneel at the same altar to receive this same body and blood with the bread and wine, that we may feed upon the same thing that binds us as the Body of Christ…the Body of Christ! How profound that the very thing upon which we feed is the very thing we are and are knit together in. That is laying up treasures for yourself in heaven. It’s returning to the only place where you are family, and that which binds you as family shall not be severed by death, by divorce, by abandonment, by hurt feelings, and by pains of differences that are on an earthly level and not on a spiritual plane. Here is where we return to be bound up and unified again in this family. And just as it is a very big sin within your own earthly family to miss a big family gathering and meal, and just as it is as affirming and unifying to be at that meal, so it is here. Obviously, not everyone is here tonight. That is why, as we leave here tonight, forgiven and refreshed, we go out in faith in God and in service to our neighbor. We go to be a good family member, loving our brothers and sisters in Christ, them and encouraging them to come back to the family gathering, back to Bible study and Sunday school, back to church and the holy assembly of God. For here, in this holy assembly, is where we lay up treasures in heaven, where neither moth nor rust destroys and where thieves do not break in and steal. Here, we build up one another in the faith and admonition of the Lord. Here, our Lord calls us to repentance that we might confess our sins and receive His absolution. Here, our Lord promises to be with His good gifts—forgiveness salvation, and eternal life. Go in the peace of the Lord and serve your brothers and sister joyfully. For Jesus’ sake, you are forgiven for all of your sins.